To Cite: Nakhaei Amroodi M. Irreducible Anterior Shoulder Dislocation Associated With Displaced Fracture of the Greater Tuberosity: An Analysis of Seven Cases, Shafa Ortho J. 2015 ; 2(4):e4023. doi: 10.17795/soj-4023. Background: Although anterior shoulder dislocation is the most prevalent type of body dislocation, irreducible anterior shoulder dislocation is seldom reported in the literature, which is usually due to physical obstacles. Objectives: This study presents our findings regarding the causes of irreducibility of anterior shoulder dislocation associated with displaced fracture of the greater tuberosity. Patients and Methods: CT scans, open reduction of the joint, and internal fixation of the tuberosity was performed in seven patients with irreducible anterior shoulder dislocation associated with displaced fracture of the greater tuberosity. Results: As confirmed by intraoperative findings, the CT scans showed the cause of irreducible shoulder dislocation in six cases was the interposition of the long head of biceps (LHB) in the anterior of the head that was displaced from the fracture line between the greater and lesser tuberosities. In another case, the greater and lesser tuberosities were attached to each other and were separated from the head. This fractured part was trapped. Conclusions: We suggest that performing CT scans in all cases of anterior shoulder dislocations with displaced fracture of the greater tuberosity can help surgeons to diagnose the accompanying fractures and possible complications, such as irreducibility. If the fracture line passes through the bicipital groove or in the case of a shield fracture, possible irreducibility should be borne in mind. The most common dislocation of the major joints in the human body is that of the glenohumeral joint of the shoulder, and over 95% of dislocations are anterior dislocations (1). The closed reduction of the anterior dislocated joint is performed under general anesthesia with adequate muscle relaxation accomplished using various maneuvers and techniques (2). Several cases of anterior shoulder dislocations recur after reduction, and various methods have been introduced to decrease the recurrence rate (3, 4). However, there are some cases that do not respond to the initial closed reduction. These dislocations are known as irreducible anterior shoulder dislocations and require open surgery; unfortunately, these are rarely reported on (5). Although arthroscopic intervention has been recently introduced, open surgery still remains the gold standard (1). As reported in a few cases, some obstacles may interfere with closed reduction, including an interposed bicipital tendon (6), a subscapularis tendon (7), dislocated fragments of the anterior glenoid (8), and greater tuberosity (9). Preoperative evaluations with computed tomography (CT) scans help physician detect these associated problems and help the surgeon in the operation (10). Yet, there is no consensus regarding the gold standard imaging method for diagnosis, the most suitable surgical approach, postoperative management, or probable complications. Irreducible anterior shoulder dislocation with fracture of the greater tuberosity has rarely been reported (9, 11). We reviewed our findings of the causes of irreducibility of anterior shoulder dislocation associated with displaced fracture of the greater tuberosity treated 5 to 10 days after the initial injury. The findings were compared with other similar studies. In this study, seven patients with irreducible anterior shoulder dislocation associated with displaced fracture of the greater tuberosity were evaluated. All had an unsuccessful closed reduction under adequate general anesthesia with muscle relaxation and were referred to our center. Patients with irreducible shoulder dislocation but without a greater tuberosity fracture were excluded. This retrospective study was approved by our institutional review board. A physical examination that included the head, neck, chest, abdomen, pelvis, and limbs, especially the injured limb and its neurovascular status, was performed and the results recorded. Anteroposterior and true lateral scapular view X-rays and a three-dimensional CT scan of the affected shoulder were obtained to determine the cause of irreducibility and for operative planning. After general anesthesia, the patient was positioned in the beach chair position. The shoulder was explored using the deltopectoral approach; the cephalic vein and deltoid muscle were retracted to the lateral and pectoralis major muscle, and conjugated tendons were retracted to Medial side. The long head of biceps tendon (LHB) was exposed, and the cause of the unsuccessful closed reduction was assessed. The LHB was lacerated in all cases; thus, a tenotomy was done from the supraglenoid tubercle. In cases 1 to 6, the head was easily reduced after the LHB tenotomy and then the greater tuberosity was fixed transosseously to its anatomic site using heavy non-absorbable sutures. The LHB was then tenodesed to soft tissues around the bicipital groove. In case 7, the LHB tenotomy (from the supraglenoid tubercle) was first performed, but the head could not be reduced. Next, the subscapularis tendon and the infraspinatus tendon were held by stay sutures without being separated from the fractured part and were retracted anteriorly away from the glenoid. The head was then reduced. The fractured part was fixed in the same way, and the LHB was tenodesed. After confirmation of anatomic reduction with intraoperative Anteroposterior (AP) radiographs, the wounds were closed layer by layer on a hemovaccum drains and dressed. The affected upper limbs were immobilized to the chest by slings and swathes. Two weeks postoperatively, the sutures were removed and intermittent pendulum and passive forward flexion exercises were started. Slings and swathes were removed at four weeks postoperatively, and passive and active assisted exercises for abduction, external rotation, and internal rotation were added gradually to obtain full ranges of motion. Strengthening exercises were started eight weeks postoperatively. A thorough physical examination was performed to rule out possible injuries to other organs, and the involved upper limbs were examined for any injuries to neurovascular structures. Patients’ data in terms of age, interval between the accident until closed reduction (hours), interval between the accident until open reduction (days), and the affected shoulder and accident type were recorded. Radiographic studies of the involved shoulders included anteroposterior and true lateral scapular view X-rays. A three-dimensional CT scan was obtained to clarify the cause of irreducibility and for better operative planning. Intraoperative findings, including the cause of irreducibility, were recorded and confirmation of anatomic reduction was obtained with intraoperative AP radiographs. There were seven patients with irreducible anterior shoulder dislocation associated with displaced fracture of the greater tuberosity. Even though we gathered all the preoperative and intraoperative findings regarding the cause of irreducibility for the sake of comparison, we found no similar studies except some rare case reports. Therefore, we performed a statistical analysis of some demographic data only. Between May 2008 and April 2015, we evaluated and treated seven patients who met the inclusion criteria of this study. All patients had shoulder dislocation with displaced fracture of the greater tuberosity. Upon a physical examination, anterior shoulder dislocation was detected. All patients were otherwise healthy without any underlying disease, such as coagulopathy, heart, kidney, or liver dysfunction, or history of a previous fracture or upper limb surgery. All seven patients were male, and the mean age was 30.1 (range: 23 - 42). The mean interval between the accidents and the closed reductions was 8.4 hours, and the mean interval between the accidents and the open reductions was 7 days. 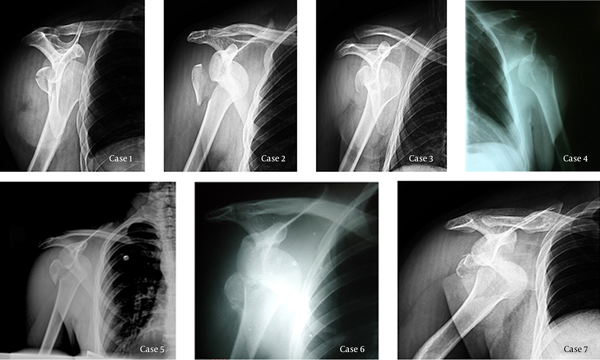 Radiographic imaging (anteroposterior and true lateral scapular views) was performed for all cases before the closed reductions, which showed anterior shoulder dislocation with displaced fracture of greater tuberosity in all cases (Figure 1). Five patients had right shoulder dislocations and two had left shoulder dislocations. All were right-handed (Table 1). Anterior shoulder dislocation with displaced fracture of greater tuberosity. Intraoperatively, the cause of the irreducible shoulder dislocation in cases 1 to 6 was found to be the interposition of the LHB in the anterior of the head, which was displaced from the fracture line between the greater and lesser tuberosities into the glenoid and was trapped in front of the head (Figure 2). This type of fracture was obvious on the CT scan and was confirmed during the operation. However, in case 7, the greater and lesser tuberosities were attached to each other and both were separated from the head, which is called a “shield fracture”. This fractured part was trapped in front of the head, because it was attached to the subscapularis tendon from the medial side and to the infraspinatus tendon from the lateral side. These muscles pushed the head in anterior of glenoid to medial side strongly and prohibited departing the head into the glenoid (Figure 2). The LHB was lacerated in all cases and therefore was tenotomized from the supraglenoid tubercle and tenodesed to soft tissues around the bicipital groove. Anterior shoulder dislocation with displaced fracture of greater tuberosity. The fracture line crossed the bicipital groove in cases 1 to 6 and presence a shield fracture in case 7. As the findings of this study indicated, all patients had similar radiographic imaging results (Figure 1), but case 7 had a shield fracture that was only evident upon the CT scan (Figure 2) and that required additional intervention in the surgical procedure. Allard et al. demonstrated in one case of irreducible anterior shoulder dislocation that simple radiography might not be enough to properly assess shoulder dislocation and that a CT scan and magnetic resonance imaging (MRI) are necessary (10). In their study, MRI was required in addition to a CT scan to obtain a complete picture. However, our study demonstrated the adequacy of a CT scan in assessing patients with anterior shoulder dislocation with a greater tuberosity fracture. Bridle et al. have suggested an additional radiographic image in old patients and those with significant pain (12), which demonstrates the importance of sufficient imaging before intervention. There are few reported cases of irreducible anterior shoulder dislocation with a fracture of the greater tuberosity. Aiyenuro and Zadeh reported a case with a combination of a greater tuberosity fracture, a rotator cuff tear, and a supraspinatus avulsion with a Hill–Sachs lesion repaired using the McKenzie approach. They concluded that this method made exposure and repair easy (13). Although their case was more complicated than our cases, our results showed there was no difficulty performing the procedures using the deltopectoral approach. Ilahi also, reported a case of irreducible anterior shoulder dislocation with a fracture of the greater tuberosity who required open reduction and division of the subscapularis tendon before reduction of the glenohumeral dislocation (11). Other studies have reported cases with irreducible anterior shoulder dislocation due to other mechanisms, such as an interposed bicipital tendon (6), a subscapularis tendon (7, 12), and dislocated fragments of the anterior glenoid (8). These are all uncommon and require surgical treatment. Various studies have reported late presentation or very muscular individuals as reasons for the failure of reduction (14-16). The mean time of interval between accident and closed reduction ranged from 6 to 11 hours, which indicates that all cases were referred in time for closed reduction and that the cause of irreducibility was related to a fracture of the greater tuberosity. Bahrs et al. investigated the morphology and mechanisms of greater tuberosity fractures and found that 59/103 (57.2%) were associated with shoulder dislocations (17). Therefore, paying attention to all accompanying fractures is necessary in the management of shoulder dislocations. This can be accomplished using detailed imaging methods, such as CT scans. As stated, there are very few reported cases of irreducible anterior shoulder dislocation. Thus, we aimed to report the results of seven cases to help improve understanding. Yet, more detailed studies and review studies are needed to give physicians and surgeons a better understanding of the most appropriate diagnostic tools and surgical approaches. Although irreducible anterior shoulder dislocation is not very common, it is very important to inform the patient that their dislocation might be associated with complications, such as irreducibility, and may not be easily treated by closed reduction but may require surgical intervention. The necessary equipment and skilled surgeons must be available to manage the patient properly. 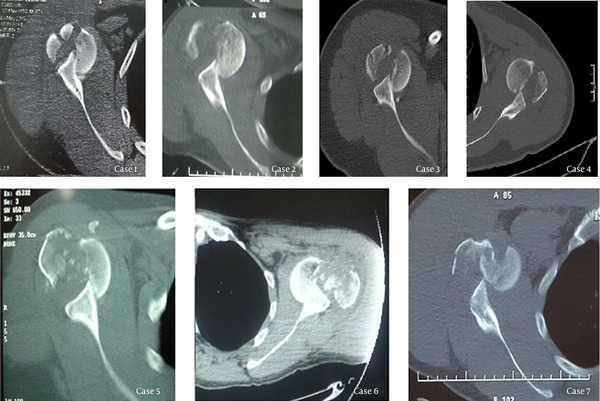 The experience of our seven cases with irreducible anterior shoulder dislocation with a displaced fracture of the greater tuberosity revealed that performing CT scans can help the surgeon to diagnose the accompanying fractures and possible complications to be prepared for other potential interventions. These dislocations may be irreducible if the greater tuberosity was detached from the bicipital groove or if a shield fracture was present anterior to the head.